So it's finally the end of the year, next week is exam week and after that there's a bunch of things happening at the same time. Since the class is so big and very limited equipment, we were split into 4 groups; A to D. A group had already started Phase Zero, which is simulators and lessons. Group B, C, and D have been chosen and each group will have to start at different times. B, C, and D groups will have a group briefing on the 21st which is the monday after exams, while Group A starts flying. The next day, the 22nd that is, Group B will start Phase Zero. Group C and D are to take their vacations at hand, and group C to start Phase Zero mid-May and D group to start end of May. Although every group have been chosen, the board still has to have a promotion meeting, which is where they decide who actually moves on to the flying program. If a student is borderline or is on probation still, they don't want them to continue to get left behind since it's only going to get harder from here on. So currently, I am in group C that means I have around 2 weeks of vacation. The summer flying semester ends on Aug. 15th but 2nd year starts two weeks earlier than others, therefore 2nd year starts Aug. 18th. So the only vacation I'm gonna get is these two weeks after exams. If I get bumped up to group B then I would have to take 2 weeks vacation in parts. The group briefing is going to be held at Markham Campus. I've only been there during orientation so it should be a good experience. This group briefing is supposed to last the whole day so that should be fun. The flight program director also announced that we have recently bought a new Cessna 172s plane to add on to our fleet. Our fleet now then consists of 7 + 1 Cessna 172s, 5 Be-33 Bonanzas, and 2 Be-58 Barons (twin engine). What bothers me though is why we have so many planes, while only having one simulator for each type plus a CRJ simulator. I think Seneca should get more simulators so that the training would be done much faster. As soon as I get to go to the airport or get any new info about the new plane I would post it up on here. I also have a few questions that I can't get my mind to twist around. How exactly does A VDF or DF Steer work? And should I also get a headset already for the flying that is to come or just use the push to talk thing that's already installed. Welcome to the blogging world. It's a good way to keep track of what you've been doing. It's interesting to read how Seneca is now doing the flying program. Different than when I went through. How many people don't make it on to the flying portion? As for your questions - for the DF steer, I've only ever done one and that was during my PPL training 9 years ago (we did it at Toronto Airways at the time) - but in the plane it's pretty startigh forward, you hold the Transmit down for 5 seconds and then the guy in the tower will tell you your bearing to (from?) the airport. These days with GPS and radar you'll pretty much never have to use it in real life. As for the headset, you'll definitely want to invest in a good one. I still have my original David Clark H10-13.4. It's lasted pretty well - I had to get the microphone replaced but it was still covered under warranty. 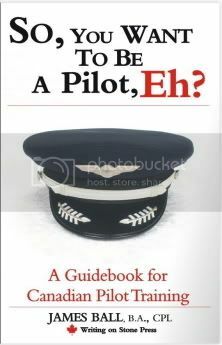 Good Luck with exams and starting your flying! I look forward to reading how it goes.